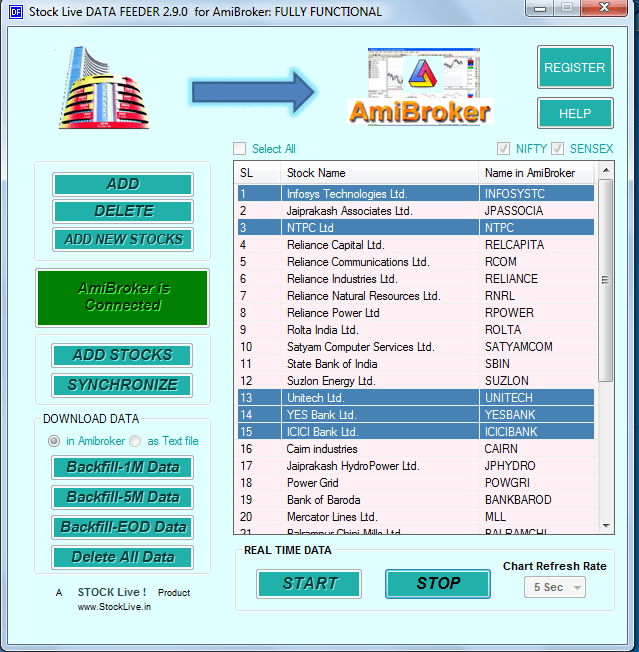 Datafeeder is a realtime third party datafeed software for amibroker which fetches the data from Yahoo Finance and feed it to the Amibroker. And Backfill data is possible for 1min data and 5 min data. It is a light weight software( just 1.25 MB) and supports a minimum refreshing interval of 5-secs. use it without going through any manual . (5) Performance wise Highly efficient as this software is highly multithreaded . Microsoft .NET Framework Version 2.0 or more latest is required to be present in the system for Data Feeder to run. Is there any such a software for MCX??? Any real time data feeder for Meta stocks ? I am facing a problem. I am getting the market data properly only for nifty index. For rest of the scripts i am getting delayed feeds. (market price and charts price are different). I have even logged in yahoo finance. Thanks for the Site Admin -- Always You gave worthy things with great efforts. U did an splendid work to small traders. any realtime data for MCX? if yes please send to my mail id. 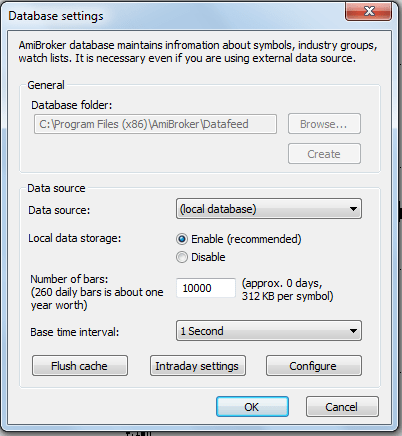 I have installed DF and amibroker. Its working. But i want to know as to how to get Buy( Green) sell( Red ) signals on the intraday graph?Pl tell me which configuration etc needs to be inserted in the AFL code or can be monitored through inbuilt buttens in the parameters shall pl be cleared. The email addres is given above.Awaiting reply. Data for scrips is delayed by 10 min. any remedy. Congrats on your wonderfull site.Stumbled onto this couple of days back.have got hooked onto this.Using datafeeder for amibroker,downloaded from your site.quick question:how to add nifty future in datefeeder??? Does DataFeeder works only for the Indian Stcok Exchange? I have downloaded and installed DataFeeder and it seems that it only supports Indian Stock Exchange. Could you please let me know of a datafeeder that works for Singapore Stock Exchanges (SGX)? My Amibroker works on Windows 7. After completing installation process I could not visiualize chart. Only black colour screen is showing up. However some indicators are showing up for some symbols. I have logged into Yahoo Finance. But i am using Firefox . It would be very helpful If this feature works. I m not able to run the Data feeder 2.9.0 in my system.The same is running in WIndows 7. I have disabled the Symantec . is there anyway you can modify the datafeeder code to provide eod data and possibly Real Time data from Yahoo or Google Finance for the UK market and US market. i would be happy to pay via paypal, i just cant find any other program that will stream into Amibroker the way i want it to. Can any one tell me how to add new scripts like Coal India. rest DF 2.9.0 is working fine. Can any one tell me how to add new one or how to work on old scripts? The email address is given above.Awaiting reply. Dear sir from last few days i am getting delayed data feed form this Stock Live Data Feeder..
sir i have checked it on different computer also, but facing the same problem..
any solution for the same..? or please suggest me some other Free Nse cash live data feeder..
Any Real time deta feeder in basic Xl or CSV format ? RTDF is now not a free data feeder. RTDF is not functioning properly. It is not updating during market hours. KIndly help me. Nothing comes free of cost. Pls Go to Manshi RT, you will get RTD for Stock , F&O , Commodity. For Amiboker & other softwares too. the datafeeder 2.9.0 does not work correctly any more ! i use it to download 1 min intraday data as text files for a selected list of stocks, every evening. today, it downloaded just 2 stocks i/day data and stopped working. i tried it several times. each time it just downloaded data for only 2 stocks. please look into this and resolve. Rajandaran Sir, All yahoo intraday downloader programs stopped working. May intraday data structure changed from yahoo finance. Please help. Yahoo Api’s are not changed probably yahoo might had put some restriction on the number of queries each day which makes such datafeeder software unusable. Sir, whether your software run in SDD type harddisk?, or only need HDD type harddisk ? Sir, tablets has SDD type hard disk, which does support your software ? Try with any windows Surface tab pro tablets it should work ideally! Hi sir,I also would like to install FEEDER for my AMI BROKER . is there any other link we can get DATA FEEDS free ? Could you plz help me with the link or plz give directions as how to download here ?